Study: Swedish boys learn English from World of Warcraft. 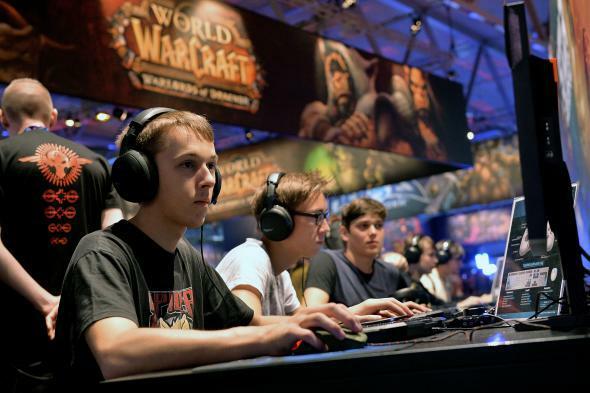 Visitors play World Of Warcraft at the 2014 Gamescom gaming trade fair on Aug. 14, 2014, in Cologne, Germany. Swedish children, especially boys, may be learning more English during a late-night Minecraft session than from struggling through hours of homework. According to a study by Swedish academics Pia Sundqvist and Liss Kerstin Sylvén, fourth-grade Swedish boys spent 11.5 hours a week on average doing things in English outside school—and a not insignificant 3.5 hours of that time were spent playing computer games like World of Warcraft, Counter-Strike, and FIFA. By comparison, Swedish girls spent only 0.4 hours of their 5.1 extra English hours a week playing such games. As Sundqvist and Sylvén note in their study, many online games incorporate key principals of effective learning that make them highly useful for taking up a foreign language. James Paul Gee, co-author of Language and Learning in the Digital Age, has written that such games are particularly helpful because of their ability to put words in “situated meaning”—words learned during games can be attached to the type of experience in which they would normally be heard, making them easier to remember than simply being told the word’s definition in a more traditional setting. “Flirt” will be more memorable if you learn it when interacting with a dwarf female, instead of from your textbook. Unfortunately for kids born in the United States or in countries where English is already the primary language, they may be at learning disadvantage in comparison to these Scandinavian kids. Given gaming banter is mostly taking place in their most familiar language, the opportunities to learn how to insult other players in, say, Russian are somewhat limited. Perhaps you should do your kids a favor and change their Minecraft settings to Spanish, all in the name of advanced language learning. Then you won’t have to feel so bad about the hundreds of hours they spend playing it.